Sutton Park, England, 1957. Ninth World Jamboree Mundial. J.I.M. Jubilee Jamboree. First to incorporate a Rover Moot and an Indaba. 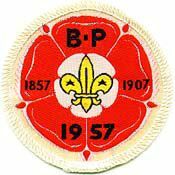 The Year of B-P´s Centenary. An amateur radio station operates from camp. Over 30,000 Scouts from more than 80 countries are present. A Scout from Pakistan hiked all the way. The camp newspaper, "Jubilee Journal", 24 pages could not contain the events of those days. And then, traditionally one might say, there was the night of the great storm. "Jamborain". An obelisk was ercted at Sutton Park to conmemorate this anniversary of Scouting.